Stamped Decorative Concrete can update any space and change up the old normal cement slab on your patio, porch, walkway, driveway and more. Concrete, or cement, is often used in spaces like these because it is durable and easy to maintain. This is good because you don’t have to worry about taking care of it much, but people don’t often think of the aesthetics. Concrete surfaces can remain durable and easily maintainable while still looking good if you get it stamped or decorative in some other way. Concrete can be made decorative in many ways. It can be stamped into different textures or patterns and it can be painted, sealed, and more. Stamping your concrete surface can give it a whole new character because it can be made to look like wood, brick, tile, stone, slate and more. It’s also less expensive than using these materials and holds up better and longer. Cement can handle a lot of foot traffic and withstand heavy objects being dragged or placed as well as driving over it. If you seal the concrete you can protect it from weather and other elements and it will last a lot longer. Are you interested in stamped decorative concrete for your property? If you are thinking about it, you should schedule an appointment to talk about our many products, services, and options. Here at D & G Cement Co. we’ve been providing outstanding cement services for over 50 years to the metro Detroit area. 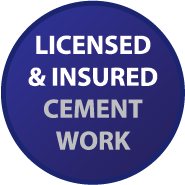 Our services include, designing, pouring, and sealing cement. To learn more about stamped decorative concrete and the rest of our products and services or to schedule an appointment give us a call at (313) 277-2676.